Except for the drone videos, these are minimally edited, amateur videos from my “field notes”. Those were taken in most cases as low-res videos, however, for some and most of those listed here, I took some hi-res videos. They are far from professional but I think give a sense of the places. Drone video Oct 9, 2017. Sweeping views of Sandy and Environs as the leaves are changing give a sense of the landscape. Upper Peverills Brook runs between Sandy Lake and Marsh Lake, Lower Peverills Brook fror March Lake to the Sackville River. The video shows pieces of the upper brook with digger logs that the Sackville Rivers Association installed in the brook to improve habitat for salmon; and the magnificant vires where the brook flows into Marsh lake. August 17, 2017. 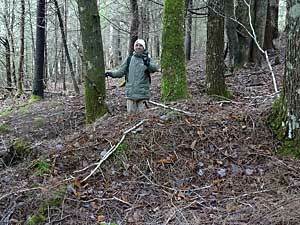 In this video taken in hardwood forest above Sandy Lake, Bedford, Nova Scotia on Dec 4, 2017, I walk across a series of pits and mounds to give a sense of the rolling topography. The mounds were formed probably about 150 years ago by uprooting of large, old growth trees as hurricane winds from the south made landfall on the Atlantic coast of Nova Scotia. The site is only a few kilometers inland. A patch of recent blowdown in hemlock/yellow birch forest on the east side of Sandy Lake. The blowdown was likely initiated by Hurricane Juan in September of 2003. Eastern hemlock and yellow birch often occur in close proximity on mounds in old forests of Nova Scotia, a phenomenon I have dubbed “The Acadian Forest Love Affair”*. Here is part of the explanation: yellow birch becoming established on hemlock blowdowns soon after the blowdown events.